On Sunday afternoon we took off to the You Yang mountains, just north of Geelong. Seemingly plonked in the middle of the plain, these knobbly hills of huge granite boulders and quiet bush are really worth a visit. We started with the short 3km Big Rock walk, which takes in – no surprise here – some REALLY BIG rocks and sweeping views across Port Phillip Bay. We then headed up the mountain to join the 5km Branding Yard Track, which dips to a quiet part of the park, out of the westerly wind, and passes by beautiful and varied bushland, the enormous Bunjil Geoglyph rock sculpture and extensive waterholes. The highlight though, was most definitely this wonderful echidna, which was feasting on ants beside the track and seemed not at all bothered by us – walking right up to just a few feet from us before eventually losing interest and heading off in search of more tucker! Great photo Julie. I’ve always wanted to see an echidna in the wild, so I’m a bit jealous. Thanks Di! 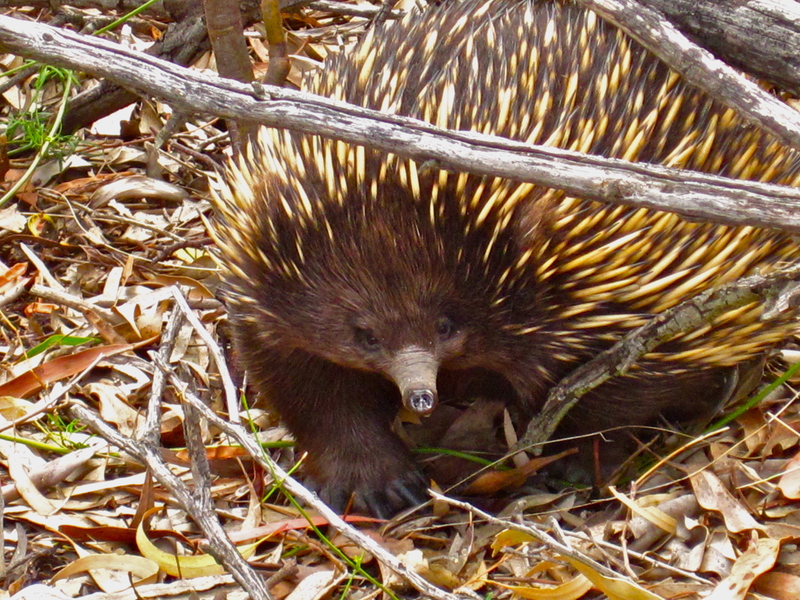 I thought it not a bad photo for a little IXUS point-and-shoot – lucky the echidna was so unfazed to walk right up to us. At one stage, I thought it was going to start licking my boots!!! Other than seeing a few echidnas on the side of the road over the years, this was the first one I had seen just wandering about, too. I couldn’t believe how relaxed, unhurried and unafraid it was – it really did just amble about: we watched it for a good 10 minutes before it pootled away. We felt incredibly privileged. The echidna is so adorable! I wish I will be able to see a live on sometime. You might have to come all the way out to Australia some day to do so Jane. They are pretty cute – they remind me of The Wombles, very ponderous – they’re about the size of a very large very fat rabbit.